The presence of keratinized tissue around dental implants is more than desirable either from a functional and aesthetic point of view, making soft tissue grafting a common practice in implant rehabilitation. Autogenous soft tissue grafting procedures are usually associated with high morbidity. Aim of this study was to assess the efficacy of a xenogeneic collagen matrix as a substitute for soft tissue grafting around dental implants. 15 consecutive patients underwent a vestibuloplasty and grafting, both in the mandible and the maxilla, with a collagen matrix. The primary endpoint was to evaluate the resorption of the graft along with the re-epithelization grafted area. The percentage of the resorption was 44,4%, with a mean gain in vestibular height of 3 mm. Secondary endpoints evaluated the clinical appearance, the hemostatic effect and the post-operative pain. All subjects referred minimal pain with no bleeding. No adverse reaction nor infection were noted. This study showed that the used collagen matrix can find major interest in those patients who need a greater aesthetic outcome as the matrix has a perfect integration with the surrounding tissues. Furthermore it is strongly recommended for those patients who can bear little pain. Post-operative morbidity of autologous grafts is the biggest concern of this type of surgery. The possibility to use a soft tissue substitute is a great achievement as morbidity decreases and bigger areas can be treated in a single surgery. The present study showed the efficacy of a collagen matrix as this kind of substitute. Keywords: Collagen matrix, Keratinized tissue, Mucosal grafts, Vestibuloplasty, Xenogeneic graft. For decades mucogingival surgery has been common practice in periodontology, with the precise endpoint to optimize the amount of keratinized soft tissues surrounding the natural teeth. Keratinized gingiva (KG) is a specialized mucosa covered with keratin or parakeratin that includes the free and the attached gingiva and extends from the gingival margin to the mucogingival junction . The presence of a certain width of keratinized tissue is important in maintaining periodontal health and preventing soft tissue recessions. A number of studies suggest that a minimum of 2 mm of KG, corresponding to 1 mm of attached tissue, is necessary for a sustainable periodontal health . The presence of this specialized mucosa appears to facilitate plaque control, improving patient comfort and prevent gingival recession [3, 4]. As well as natural teeth, the presence of keratinized tissue is more than desirable around dental implants, especially in the aesthetic zone. peri-implant soft tissues. Both free gingival and connective tissue grafts are however associated with significant patient morbidity due to the need for a donor palate site, that leaves the periosteum exposed after surgery . Unfortunately, high morbidity is common in al types of surgeries where autologous grafts are involved (like bone grafting techniques), while xenogeneic materials do not present such inconvenience . In order to avoid the morbidity associated with the donor site, an acellular dermal matrix (ADM), derived from human cadaver, started to be used as a tissue substitute [5-7]. An alternative to allodermal matrices was found in the use of collagen membranes of porcine origin [8, 9]. Despite of the presence in the current literature of many studies reporting various attempts to augment the oral soft tissues using different materials, no ideal materials are currently reported as available and, overall, predictable . Theoretically and ideal non autologous graft for soft tissue substitution should promote haemostasis, be infection resistant, favour the formation of granulation tissue, have a low post-operative morbidity and have a fast healing time. Promoting haemostasis and favouring the formation of granulation tissue are two critical steps of the healing process. The micro architecture of the xenogeneic graft will be of particular importance for blood clot organization, as shown in other studies where absorbable collagen sponges where used and different tissues (such as bone) where involved [11-13]. At the same time, a correct resorption time of the grafting material will easily influence granulation tissue and promote better healing, just like emblazoned bone reconstruction techniques . Aim of the present study was to evaluate the efficacy of a xenogenic collagen matrix (Geistlich Mucograft®, Geistlich Pharma AG, Wolhusen, CH), to increase soft tissue, used in a free gingival-like graft procedure. A multicentered (Milan University – School of Dentistry/Loma Linda University – School of Dentistry) clinical study has been conducted on patients presenting areas of deficient attached and unattached mucosa and/or deficient vestibular depth precluding the construction of effective functioning prosthesis. The study included a total of 15 patients who were candidates for mucosal soft tissue augmentation or lateral-medial mucosal extension by means of a xenogeneic collagen matrix (Geistlich Mucograft®, Geistlich Pharma AG, Wolhusen, CH). The xenogeneic collagen matrix(Mucograft®) is a class III medical device according to the Medical Device Directive 93/42 (EEC definitions: 1.1: longterm implant; 1.2: implantable; 8: resorbable and 17: porcine origin). Its structure consists of two functional layers: a cell occlusive layer consisting of collagen fibers in a compact arrangement and a thick porous layer. This porous layer provides a space that favors the formation of a blood clot and the ingrowth of tissue from adjacent sites (Fig. 1c). This xenogenic graft has been cleared by the EU and US Food and Drug Administration for regenerative therapy involving teeth and implants. The purpose of the surgery was to improve the quantity of attached and unattached mucosa in order to facilitate the final prosthetic rehabilitation. The entire study was reviewed and approved by the Ethics Committee of the IRCCS Ospedale Maggiore Policlinico di Milano, Fondazione Ca’ Granda. The primary efficacy parameters to be considered were the degree of lateral and/or alveolar extension and the evaluation of re-epithelization and shrinkage of the grafted area. The secondary efficacy parameters included: haemostatic effect, pain evaluation, medication used to control pain and discomfort and clinical evaluation of the grafted site. The duration of the present study was 1 year following implantation of Geistlich Mucograft® for each study subject. Subjects were recruited from existing subject databases as well as from screenings performed at the department of Dental Implants, Dental Clinic Fondazione Ca’ Granda, School of Dentistry, University of Milan and the department of Orall and Maxillofacial Surgery, School of Dentistry, Loma Linda University Medical Center. A total of 15 subjects, candidates for fixed mucosal soft tissue augmentation or a lateral extension of the edentulous alveolar ridge, had been recruited for the study. Subjects have read, understood and signed an approved Informed Consent Form. Subjects are able and willing to follow study procedures and instructions, including exercising good oral hygiene. Subjects are 18 years or older. Subjects are candidates for fixed mucosal soft tissue augmentation or an extension of the lateral alveolar mucosal ridge. Subjects, if of child-bearing potential, must have a negative pregnancy test (validated OTC test) within 72 hours prior to surgery and agree to use adequate contraception for at least 4 months after surgery. 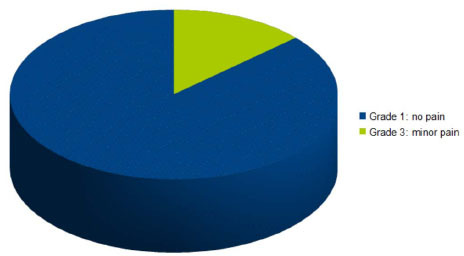 Subjects agree to be financially responsible for the prosthodontics restoration of the surgical site. Subjects have participated within the last six months in other clinical studies. Subjects have failed to maintain good plaque control at the time of the screening appointment. Suppressive therapy which would tend to compromise mucosal surgery. Subjects with significant moderate to severe periodontal disease (>Grade III), caries, or any active intraoral infection. Subjects do not agree to avoid using any nicotine-containing products within 2 weeks prior to surgery and 8 weeks after surgery (including, but not limited to, smoking and chewing tobacco, nicotine patch, nicotine gum). Chronic steroids, e.g. cumulative dose of 150 mg of prednisone or equivalent within the last 6 months. Biphosphonates or fluorides, at bone therapeutics levels, for at least 6 months prior to surgery. Vitamin D and Vitamin D metabolites at therapeutic levels for 30 days or more within the last 6 months. The Principal Investigator decided that it was in the subject’s best interest. If a subject withdrawed from the study at any time, either at his request or at the Principal Investigator’s discretion, the reason(s) for withdrawal were recorded by the Principal Investigator on the relevant page of the Case Report Form (CRF). All final visit tasks were completed for all subjects who withdrawn from the study. Subjects withdrawn due to related AEs were to be monitored until the adverse event had been solved or stabilized. The surgical procedure for this part of the study involved augmentation of attached mucosa and/or extension of the mucosal surface in edentulous patients and in partially edentulous patients who were being prepared for implant supported reconstruction. The purpose of the surgery was to improve the quantity of keratinized mucosa in order to facilitate the final dental reconstruction. A secondary purpose for the surgery was to remove muscular and fibrous attachments which are located in adverse positions occlusally at the alveolar-vestibular interface. A standard mucosal augmentation procedure, which is well-reported in the literature, was undertaken . The surgical site produced by the surgery leaved a “denuded area” supraperiosteally which was addressed by “grafting” with a xenogeneic collagen matrix (Geistlich Mucograft®, Geistlich Pharma AG, 6110 Wolhusen, CH). The procedure was performed in areas in which an occlusal augmentation or a lateral mucosal extension of crestal soft tissue was needed. A longitudinal incision was performed in the residual keratinized band, extending to the periosteum overlying the bone. This supra periosteal incision was carried posteriorly and anteriorly to the extent of the desired vestibular deepening. Any muscle fibers and fibrous banding attached in the area were dissected from the periosteum and were reduced toward the depth of the vestibule. In addition, submucosal fatty tissue was also dissected from the periosteum over the bone in the area. The alveolar extension of the incision was made just into the area of the attached mucosa of the lateral alveolar ridge. 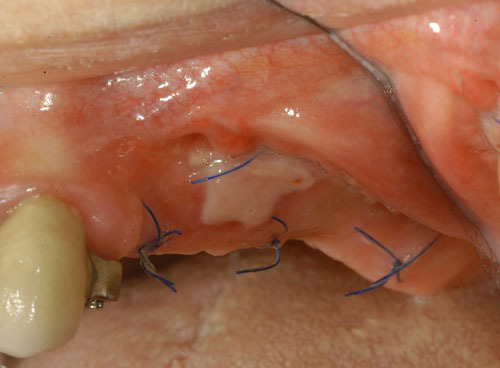 The lateral portion of the mucosal flap was sutured to the periosteum in the depth of vestibule. The denuded area of the wound in the vestibule was then covered by the Geistlich Mucograft®. The Geistlich Mucograft® was sutured to the surrounding mucosa anteriorly, posteriorly and in the vestibular direction (inferior in the case of the mandible and superiorly in the case on the maxilla). The suturing was by 5-0 nylon. 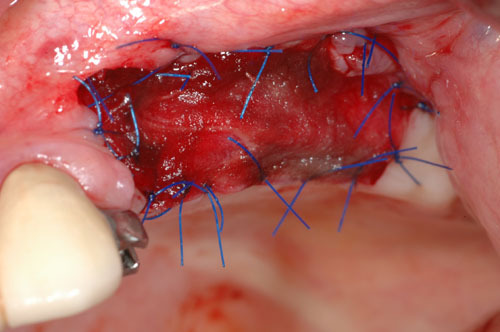 Approximately half of these sutures were allowed to remain in place for a period of 4 to 6 weeks to determine the outline of the original periphery of the incision and “graft” post-operatively. This was important in determining the area of actual re-epithelization of the defect, and in determining and quantifying any shrinkage by scarring in the grafted area. A previously prepared acrylic splint was placed over the vestibuloplasty site at the time of surgery. This splint remained in place for 10 days at which time it was removed. The patient had to irrigate the area with 0.9% NaCl solution directly for the remaining portion of the study. The entire procedure has been described in literature . All examiners were blinded as to the patients smoking status, claims and discomfort, amount of pain medication consumed, initial bleeding scores or any other measurable parameter. Examiners were calibrated to ensure consistency by standard intraexaminer calibration techniques. A Kappa score of at least 90% was required. The patients were seen 3 and 10 days after surgery as well as 2, 3, 4 and 8, weeks, 6 months and 1 year post-operatively. Additionally, patients were seen at any time during the course of the clinical evaluation. Outcome assessments are as follows. For the construction of a splint to retain the test material graft. This splint was allowed to remain in place for 10 days. For a pre-operative indication of the mandibular sulcular depth. The mandibular depth was measured in millimeters at approximately 3 to 5 points depending on the length of area that was reconstructed (usually one mesially, one distally and 1 to 3 in between). This method has been previously reported in the literature . The different steps were photographically documented. 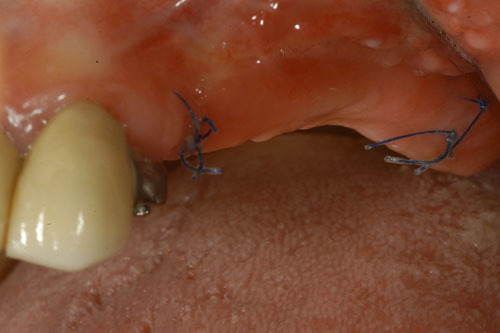 The Geistlich Mucograft® was sutured to the surrounding mucosa by 5-0 monofilament nylon. The size of the regenerated area and the degree of scarring which might reduce the area was determined by leaving half of the monofilament nylon sutures in place for a period of 3-4 weeks. The sutures served as a marker for measurement of the regenerated area. In all patients, the depth of the vestibule was recorded by probing at 3 to 5 points. Measurements were taken at each post-op visit. The non-distended grafted area was measured at the time of surgery through the center of the graft from peripheral sutures to the opposite peripheral side. Photographs were taken. No active remarkable bleeding during the procedure, no post-operatively bleeding and normal post-operative hemostatic course. Slight bleeding at the graft margins at the completion of the procedure, but no bleeding post operatively. No additional bleeding experienced by the patient post-operatively. Post-operative hematoma or bleeding at the graft margins or beneath the graft surface at any post-operative time. The condition is controllable by pressure means. Intraoperative bleeding and immediate bleeding post-operatively. This refers to haemorrhage that is controlled by surgical means, but determined to be greater than normal. The Mankoski Pain Scale  was used to determine and to record the discomfort degree experienced by the patient. Pain was assessed at each post-operative visit as indicated previously or whenever the patient experienced an incident of increased discomfort. The patient had to be seen on call at any time and the pain evaluated and appropriately treated. Medication for discomfort was based on the above cited Mankoski Scale. No medication would be necessary for 0-3, for 4-5 mild analgesics (ASA, acetaminophen ibuprofen) may be needed. For 6-7 it would require stronger medication (e.g. synthetic hydrocodones). #8-9 would necessitate increased use of narcotics including codeine and some additional medication of the order of triplicate prescription drugs. The latter would be a reportable incident event. Operative time was recorded starting at the first incision and finishing with the last suture. Evaluation of the grafted site was done by means of digital photographs taken at the indicated post-operative visits of Day 3, Day 10, and at 2 weeks, 3 weeks, 4 weeks, 8 weeks, and 12 weeks. These photographs indicated the texture of the regenerated area, the color of the regenerated tissue and the extent of the regenerated clinically-apparent new mucosa (Figs. 1a-1f) . Fig. (1c). 2 weeks after surgery. Fig. (1d). 4 weeks after surgery. Fig. (1e). 6 months after surgery. Fig. (1f). 1 year after surgery. Since this study involved the acceptance of all patients who satisfied the inclusion and exclusion criteria, it was difficult to determine an exact number of patients that would produce significance of the derived data. Since a split-mouth design was not feasible and the defects being corrected by the mucosa particularly in the vestibular portion of the study are not usually symmetrical or bilateral, the use of paired subjects was not a reliable format. However, the data accumulated by the study would have been similar to that reported in the literature in evaluation of materials of this type and the data as indicated above should have had clinical application . It appeared that an appropriate number of patients for the proposed study was approximately 15. Table 1. Criteria for evaluation. Aim of the study was to evaluate the efficacy of a xenogeneic collagen matrix as a substitute of soft tissue quality optimization in implantology. A total of 15 patients were enrolled for the study, 12 females and 3 males, aged between 43-72 years old. Of these patients, 11 received surgery in the mandible and 4 in the maxilla. At 1 year 2 patients dropped out of the study: patient n°111 experienced a perimplantitis that required a conventional free gingival graft procedure while patient n°113 developed peri-implant pockets with perimucositis, making the 1 year analysis possible only on 13 patients. No allergic reactions were registered during the clinical trial. All the data were analyzed with IBM’s SPSS Statistics using ANOVA Repeated Measurements statistical method. The following results were obtained by calculating the average loss in height at 6 months and 1 year after the surgery. All the measurements of this primary endpoint are shown in Table 2. Table 2. Probing depths at each post-operative visit (from mesial to distal). The average size of the grafted matrix was 8 mm in height per 22 mm in length. The vestibular probing depth (PD) was measured in millimeters at approximately 3 to 5 five points depending on the length of the area that was grafted. Pre-operative and post-operative probing mean values were 4,1mm and 9,4mm respectively, corresponding to an initial mean gain of 5,3mm. The probing mean value at 6 months after surgery was 7,3mm, resulting in 2,1mm mean loss in height. After 1 year from the surgery the probing mean value was 7mm, indicating an additional 0,3mm loss. (Tables 3 and 4; Fig. 2). This data indicates a 39,5% contraction of the vestibular area at 6 months, while it goes up to 44,4% after 1 year. There are differences between the values recorded from the maxilla and the mandible: vestibular PD in the mandible showed 31% and 42% shrinkage versus 42% and 54% in the maxilla, at 6 months and 1 year respectively. Considering each single value can be helpful to see the distribution of these results. Fig. (2). Changes over time in vestibular PD. Fig. (3a). Shrinkage at 6 months. Fig. (3b). Shrinkage at 1 year. Clinically, it was assessed that the height of the keratinized tissue was never lower than the adjacent sites, thus confirming that the height of keratinized tissue is genetically pre-determined. Table 4. 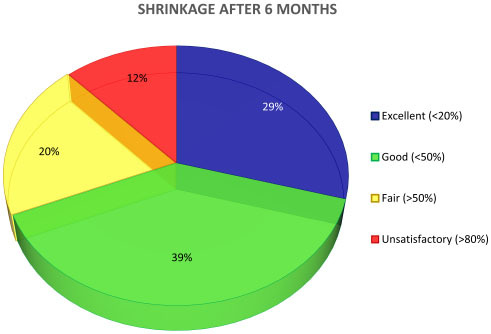 Degree of shrinkage and percentages per single patient. 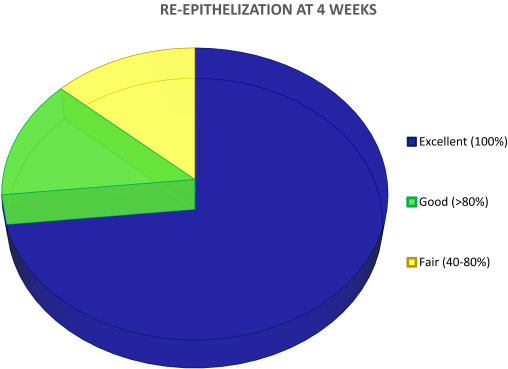 For what concerns re-epithelization, it was clinically shown that healing was completed after 4 weeks in 11 patients (evaluated as excellent), 80% in 2 patients (evaluated as good) and between 40-80% in the remaining 2 subjects (evaluated as fair). After 8 weeks healing was completed in all patients. Digital pictures were taken at each post-operative visit as indicated by the protocol (Fig. 4). Fig. (4). Healing evaluation: re-epithelization at 4 weeks. Other information can be found from the analysis of the data concerning the secondary endpoints. According to the post-operative experience described by the patients themselves, the bleeding score was 1, comparable to non-bleeding. Bleeding scores were registered during surgery and at the first two post-op follow-ups (3 days and 10 days after surgery), with the method reported previously in the “Materials and Methods” section. 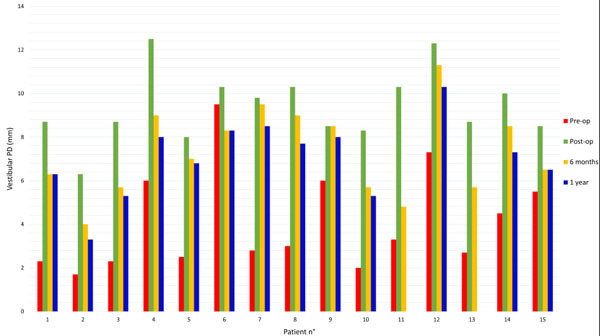 13 patients referred absolutely no pain after surgery, comparable with a Mankoski’s scale grade 1, while 2 patients took a mild analgesic (NSAID) after the surgery (comparable with a grade 3) (Fig. 5). The Mankoski pain scale has been previously discussed in the “Materials and Methods” section. Pain was registered until it was clinically assessed that healing of the grafted site was completed. Fig. (5). Pain evaluation: grades in Mankoski’s pain scale. The study was carried out to evaluate the efficacy of a xenogeneic collagen matrix when used as a soft tissue substitute in the reconstruction of an adequate amount (at least 2 mm) of keratinized tissue around dental implants. In particular, shrinkage, re-epithelization, hemostatic effect, post-operative morbidity and the aesthetic outcome were evaluated. The collected data can be partially compared with the results of other studies found in literature for what concerns the use of non-autologous grafting techniques. One of the first studies was conducted by Schoo and Coppes, who experimented the capacities of a freeze-dried dura mater grafting material (different from today’s ADMs) in stimulating keratinized mucosa, with very poor results . Two studies by Harris, in 2001, analyzed the usefulness of ADMs when positioned upon periosteum  and bone , without any particular results. Furthermore in 2001 Wei P. and Laurell L. conducted two studies: one clinical and the other histological. 12 patients were enrolled for these studies, 6 of whom received an autologous graft while the remaining an allogeneic one. The increment in adherent mucosa was detectable in both groups, but the gain was very little with the allogeneic graft. This was due to an excessive shrinkage of the graft post-operatively. Histologically it was shown that all grafted sites presented a tissue very similar to scar tissue, incapable of inducing cellular differentiation. One of the biggest concerns about this material was the fast resorption [22, 23], leading to a disturbed healing. As a connective tissue graft, acellular matrices are epitheliazed by proliferation of the surrounding tissue. The only way to obtain keratinized tissue is to put in contact the margins of the graft with the host’s keratinized mucosa . Subsequent studies obtained better results. The same Harris underlined the efficacy of ADMs as a substitute in soft tissue grafting, pointing out the great aesthetic outcome . Other authors (Lee KH, Kim BO et al.) demonstrated how these matrices show statistically significant and comparable results confronted with the most emblazoned autologous grafting techniques, evaluating keratinized mucosa augmentation, gain in thickness, plaque index, bleeding on probing and vestibular depth . These results were all confirmed by a further histological study . During the first week of healing they noticed a tissue remodelling due to phagocytosis of pre-existing collagen fibers by macrophages. At week 2, new collagen fibers were detected as long as neoangiogenesis and re-epithelization on the membrane surface. At 4 weeks it was difficult to find pre-existing collagen fibers. At 10 weeks the healing process was complete and the aestethic outcome good. A study by Sanz M and coworkers confirmed how xenogeneic collagen matrices guarantee predictable and satisfactory results. In particular, for this study, a porcine derived collagen matrix was used. The primary endpoint was to evaluate the potentiality in gaining keratinized tissue in comparison with an autologous graft. At 6 months (end of study) the collected data was perfectly comparable, showing an insignificant statistical variance between the two grafts (60% shrinkage for the autologous and 67% for the xenogeneic) . Nevins M. et al. had the same results evaluating the porcine collagen matrix around a single tooth. At 12 months from surgery, both grafts (xenogeneic and autologous) had a perfect healing, with mature connective tissue and the presence of a nice keratinized mucosa. The author itself wanted to underline better aestethic outcome of the collagen matrix, showing a perfect tissue integration . Similar outcomes were found by Schmitt CM, Tudor C et al. in their study, which compared free gingival grafts and a porcine collagen matrix (Geistlich Mucograft®). At 90 days after surgery biopsies were harvested for histologic and immunohistologic analisys showing the presence of specific keratinized tissue markers in the collagen matrix grafted areas. Furthermore, secondary endpoints concerned length of surgery, post-op morbidity and clinical appearance with results comparable to the ones obtained in the present study . The data collected in the present study can be perfectly compared with the data from other studies and can be considered satisfactory for what concerns the set endpoints. At 6 months the majority of the results falls between the interval considered as excellent or good, while at 1 year there is balance between excellent/good results and fair ones. Analyzing the post-operative course, from all the aforementioned studies, one factor is particularly highlighted: the great decrease in morbidity. Post-operative pain in autologous grafting is due to the second surgical site, the donor site. The majority of patients who underwent this type surgery didn’t feel any pain at all, except a little nuisance that required a mild analgesic as medication. It has to be said that this material is extremely easy to use, with an average length of surgery of 30 minutes (time took from the first incision to the last suture), also confirmed by literature . About intra-operative and post-operative bleeding, the xenogeneic collagen matrix showed a nice hemostatic effect with no excessive bleeding during surgery and no bleeding at all during post-operative course, comparable to the use of absorbable collagen sponges in different kind of treatments, like bisphosphonate related necrosis of the jaw surgeries or reconstructions after tumor resection [30, 31]. Furthermore, all grafted sites presented, when healing was completed, an optimal integration with the surrounding tissues, as stated by other authors in previous studies [27-29]. A precise time of surgery, in particular second stage surgery or re-entry, could help achieving the best results, as suggested by a literature review on vestibuloplasty techniques by Bassetti et al. . 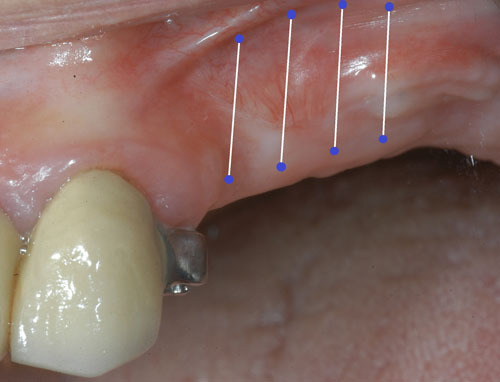 Unfortunately studies involving only an apically repositioned split thickness flap are very limited, but it has been shown that this technique is more effective in the maxilla, where a bigger reservoir of keratinized mucosa is present . Wider experience and more studies on the comparison between adding a xenogeneic graft or not should be pursued for the future. The analysis of the data establishes that the collagen matrix satisfies entirely the primary and the secondary endpoints of this study. 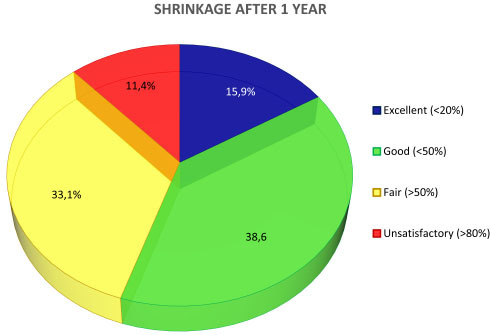 The percentage of shrinkage of the graft is not high, as shown in the evaluation criteria. The collagen matrix integration is slow and constant, providing the necessary scaffold to regenerate keratinized mucosa and ensuring a perfect healing. No bleeding was reported by the patients and post-operative morbidity was very low. At the simple observation of the grafted areas it is possible to notice the high aesthetic outcome. No “patch-work” effect nor dischromia with the surrounding tissue was observed. This is due to the migration of epithelial cells on the surface of the collagen matrix, which does not happen with autologous grafts, who maintain their own epithelium. This study shows that this type of collagen matrix (Geistlich Mucograft®) can find major interest in those patients who need a keratinized tissue augmentation around implants with great aesthetic outcome or that can bear little pain. It is well known that a sample of 15 patients cannot be considered statistical significant and for this reason further studies will be necessary to assess definitively the efficacy and the applications of this material, eventually gaining statistical value . Dorfman HS, Kennedy JE, Bird WC. 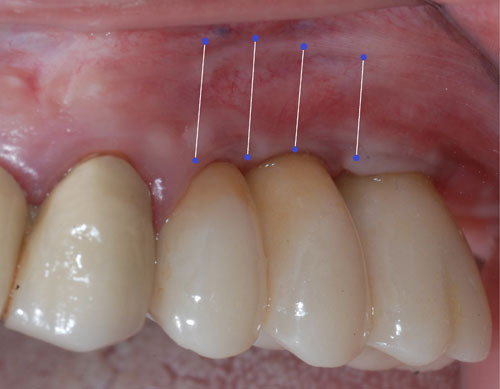 Longitudinal evaluation of free autogenous gingival grafts. J Clin Periodontol 1980; 7(4): 316-24. Wennström J, Lindhe J. Role of attached gingiva for maintenance of periodontal health. Healing following excisional and grafting procedures in dogs. J Clin Periodontol 1983; 10(2): 206-21. Zucchelli G, Mele M, Stefanini M, et al. Patient morbidity and root coverage outcome after subepithelial connective tissue and de-epithelialized grafts: a comparative randomized-controlled clinical trial. J Clin Periodontol 2010; 37(8): 728-38. Imberman M. Gingival augmentation with an acellular dermal matrix revisited: surgical technique for gingival grafting. Pract Proced Aesthet Dent 2007; 19(2): 123-8. Park JB. Increasing the width of keratinized mucosa around endosseous implant using acellular dermal matrix allograft. Implant Dent 2006; 15(3): 275-81. Yan JJ, Tsai AY, Wong MY, Hou LT. Comparison of acellular dermal graft and palatal autograft in the reconstruction of keratinized gingiva around dental implants: a case report. Int J Periodontics Restorative Dent 2006; 26(3): 287-92. Hämmerle CH, Jung RE, Feloutzis A. A systematic review of the survival of implants in bone sites augmented with barrier membranes (guided bone regeneration) in partially edentulous patients. J Clin Periodontol 2002; 29(3)(Suppl. 3): 226-31. Thoma DS, Benić GI, Zwahlen M, Hämmerle CH, Jung RE. A systematic review assessing soft tissue augmentation techniques. Clin Oral Implants Res 2009; 20(4)(Suppl. 4): 146-65. Herford AS, Boyne PJ. The use of a special collagen surgical dressing in mucosal surgery. American Institute of Oral Biology 59th meeting. Palm Springs, CA. 2002. Scharf DR, Tarnow DP. Modified roll technique for localized alveolar ridge augmentation. Int J Periodontics Restorative Dent 1992; 12(5): 415-25. Hall HD, O’Steen AN. Free grafts of palatal mucosa in mandibular vestibuloplasty. J Oral Surg 1970; 28(8): 565-74. Schoo WH, Coppes L. Use of palatal mucosa and lyophilized dura mater to create attached gingiva. J Clin Periodontol 1976; 3(3): 166-72. Harris RJ. Gingival augmentation with an acellular dermal matrix: human histologic evaluation of a case--placement of the graft on periosteum. Int J Periodontics Restorative Dent 2004; 24(4): 378-85. Harris RJ. Gingival augmentation with an acellular dermal matrix: human histologic evaluation of a case--placement of the graft on bone. Int J Periodontics Restorative Dent 2001; 21(1): 69-75. Wei PC, Laurell L, Geivelis M, Lingen MW, Maddalozzo D. Acellular dermal matrix allografts to achieve increased attached gingiva. Part 1. A clinical study. J Periodontol 2000; 71(8): 1297-305. Wei PC, Laurell L, Lingen MW, Geivelis M. Acellular dermal matrix allografts to achieve increased attached gingiva. Part 2. A histological comparative study. J Periodontol 2002; 73(3): 257-65. Harris RJ. Clinical evaluation of 3 techniques to augment keratinized tissue without root coverage. J Periodontol 2001; 72(7): 932-8. Kang-Ho L, Byung-Ock K, Hyun-Seon J. 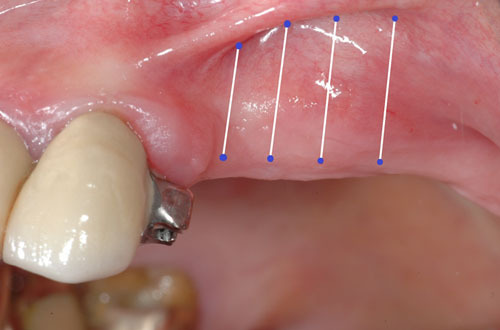 Clinical evaluation of a collgen matrix to enhance the width of keratinized gingiva around dental implants. J Periodontal Implant Sci 2010; 40: 96-101. Scarano A, Barros RR, Iezzi G, Piattelli A, Novaes AB Jr. Acellular dermal matrix graft for gingival augmentation: a preliminary clinical, histologic, and ultrastructural evaluation. J Periodontol 2009; 80(2): 253-9. Sanz M, Lorenzo R, Aranda JJ, Martin C, Orsini M. Clinical evaluation of a new collagen matrix (Mucograft prototype) to enhance the width of keratinized tissue in patients with fixed prosthetic restorations: a randomized prospective clinical trial. J Clin Periodontol 2009; 36(10): 868-76. Nevins M, Nevins ML, Kim SW, Schupbach P, Kim DM. The use of mucograft collagen matrix to augment the zone of keratinized tissue around teeth: a pilot study. Int J Periodontics Restorative Dent 2011; 31(4): 367-73. Schmitt CM, Tudor C, Kiener K, et al. Vestibuloplasty: porcine collagen matrix versus free gingival graft: a clinical and histologic study. J Periodontol 2013; 84(7): 914-23. Bassetti RG, Stähli A, Bassetti MA, Sculean A. Soft tissue augmentation procedures at second-stage surgery: a systematic review. Clin Oral Investig 2016. [Epub ahead of print]. Hannigan A, Lynch CD. Statistical methodology in oral and dental research: pitfalls and recommendations. J Dent 2013; 41(5): 385-92.